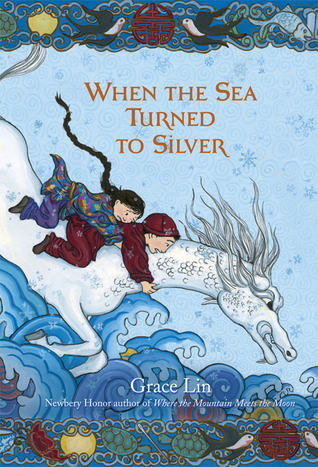 When the Sea Turned to Silver by Grace Lin. Little, Brown Books for Young Readers, 2016. Paperback. 384 pages. When the Sea Turned to Silver is a beautiful, magical story filled with adventure and a wonderful fairy tale-like storytelling atmosphere. It was only after reading this that I discovered that it is in fact a companion novel to Lin's When the Mountain Meets the Moon, but fortunately this has no bearing on following or understanding this book. Lin's story starts with Pinmei, granddaughter of her small village's beloved storyteller. The peace that currently inhabits her village is destroyed, however, when her grandmother is taken by the Emperor's soldiers and Pinmei takes it upon herself to embark upon a journey to save her. Pinmei herself is an extremely endearing and relatable character, and her friend Yishan brings even more color and excitement to the story. Along the journey, the author has both Pinmei and her grandmother intersperse the story with many short tales about much of the myths and lore of their culture. I loved these stories, and they blended in well with the current action of the plot, as well as truly brought the culture of the setting alive. I found Pinmei to be a wonderfully complex and intriguing character. She not only discovers her own gifts and strengths, but she also makes deep, lasting relationships with many of the other characters. I actually felt as though all of the characters in this book were complex and underwent a variety of dynamic changes, whether big or small. Lin writes with a poetic, almost lyrical prose that makes it just about impossible to not to keep turning pages. When the Sea Turned to Silver is a truly a magical story, and I don't know how else to describe it. It is exciting and filled with delightful characters. Overall, I am giving When the Sea Turned to Silver four stars! This sounds like such a great read. I wish there had been more books with characters like this around when I was growing up. Great review!